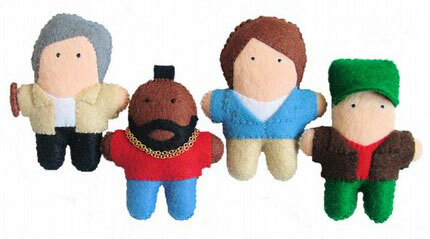 Well, the Little A-Team aren’t that hard to find – they’re available to buy on Etsy. All are three-inches tall, with Hannibal Smith resplendent with cigar in hand, Face Peck in typical 80s casual gear, ‘Howling Mad’ Murdock with flight jacket and baseball cap and of course, ‘B.A.’ Baracus packing a gold chain. Available to buy online from Etsy, the set is priced at $80, which is around £40.